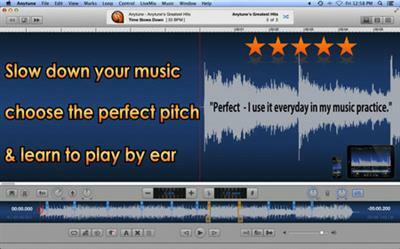 ANYTUNE is the ultimate music practice app for singers, dancers and musicians of all kinds. Artists worldwide use Anytune to learn to play, transcribe and practice songs by slowing down the tempo, adjusting the pitch, repeating loops, and sharing comments using their favorite tracks. Plug in and play along with the band using LiveMix and shape the sound with the FineTouch EQ. Slow Downer Music Practice Perfected.